The big game is an annual extravaganza that consists of enjoying a beer (or three) with friends, eating way too many appetizers, and dropping your jaw when you realize how expensive those 30-second advertisements during the big game really are. It’s true: In 2017, each 30-second commercial during the big game sold for $5 to $5.5 million. Over the years, these ads have provided plenty of entertainment – both for the value of creative in those that deliver and the critical discussion of those that do not. In fact, 53 percent of viewers surveyed stated that they’d be disappointed if the game did away with commercials altogether. For as entertaining as they might be, commercial spots during the big game simply are not a strong investment for small- and medium-sized businesses. How can your brand engage fans during the big game without forking over millions of dollars? The platform known for disappearing photos and a dancing hot dog can offer value to brands looking to create memorable experiences. What better time to develop a Snapchat marketing strategy for your company than during the game when people are looking forward to interacting with brands? Plus, filters cost significantly less than a full-fledged commercial, making Snapchat an effective platform for small businesses to utilize. Still not sold? Here’s why Snapchat marketing can help give your brand a touchdown during the big game and other sporting events. Let’s face it: Smartphone addiction is real. Even when users are watching the latest crime drama or cheering on their favorite team during a competitive game, they’ve become accustomed to giving a portion of their attention to a second screen. A November 2017 study found that 70 percent of the American population interacts with a digital device while watching TV. This means that even if a brand runs a hilarious commercial, (puppymonkeybaby, anyone?) on primetime, their audience might not be paying attention to the TV. The answer to this is not simply making the creative more breakthrough or interruptive. As marketers, we should recognize what has our audience’s attention to more effectively target them. Turns out, they’re likely on Snapchat. The company released data showing that active Snapchat users are more likely to be on their phones while watching games than non-Snapchat users. 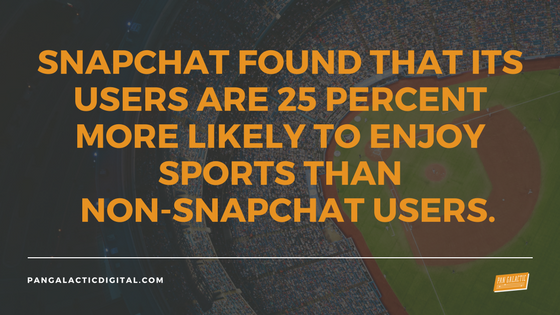 Snapchat also found that its users are 25 percent more likely to enjoy sports than non-Snapchat users. 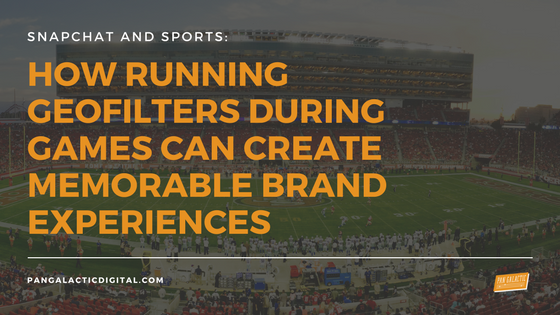 Placing Snapchat filters during the big game or other sporting events can create a brand experience that lures users in further to their phones during games. Not only are these commercials pricey, but also they don’t offer marketers the chance to strategically target their advertising. When a brand purchases a commercial, they’re paying to potentially reach all 111 million people watching the game – 111 million viewers with different interests and purchase needs. Although this is great for brand exposure, it limits the opportunities brands have to target unique messages to the varying audiences tuning in. Snapchat is different. The app provides marketers with multiple ways to target different audiences, from creating geofilters to placing them at different locations— even down to the square foot. Budget-conscious marketing teams can also easily keep tabs on how much they’re spending by controlling how much or little square footage of an area to cover. Consumers don’t want to be sold to. Instead, they’re looking for creative brand experiences. 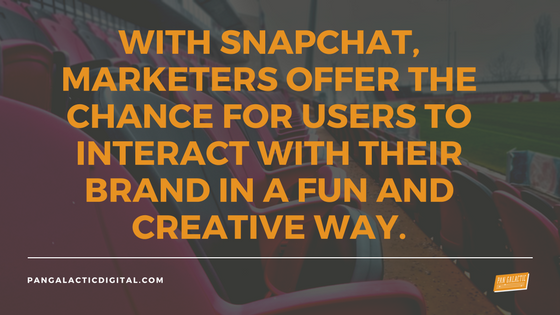 With Snapchat, marketers offer the chance for users to interact with their brand in a fun and creative way. Rather than watch an advertisement, consumers can place a hat on themselves or take a selfie surrounded by confetti or whatever else is relevant to the greater event, creating memorable experiences along the way. Once a user takes a photo with a filter, they have the option to place it on their Snapchat story or send it to friends. Unlike traditional commercials or social media campaigns, Snapchat filters give consumers control to send — or not send — these branded messages to their peers. While this might make marketers who want more control over their advertising anxious, it pays off in the long-run. A Nielsen study found that recommendations from friends and family are the most trusted form of advertising. Users who send a Snapchat filter aren’t directly endorsing a product, but they still generate organic peer-to-peer conversations. Snapchat understands that marketers are using the platform to deliver creative messages to users, so they’re making it easier for brands to get a better ROI. In December 2017, Snapchat debuted branded animated geofilters with the launch of Dunkin Donuts’ winter solstice campaign. The big game may only happen once a year, but an effective Snapchat digital marketing strategy can be implemented at other sporting events. At Pan Galactic Digital, we were approached by Deveraux, Stokes, Fernandez, & Leonard – a St. Louis-based personal injury law firm – that wanted to raise brand awareness for the practice. We’re lucky to work with a creative client who was eager to test how well Snapchat would work for his firm. We brainstormed places St. Louisans spend time at, and Busch Stadium was the obvious answer for our baseball-obsessed city. Once you’re ready to run Snapchat geofilters during a sporting event, here’s a handy checklist to follow. This varies by season, but think of which sports in your target city are the most popular. Placing a filter in Boston? Try targeting a New England Patriot games. For our client, we knew that St. Louis is a baseball town, so running filters during Cardinals games was an obvious choice. Chances are, you’re more likely to have success if you target weekend games. Keep in mind that it might be more expensive to place geofilters on Saturday evenings, so play around with the dates and location feature on Snapchat to get an idea for pricing. Our client wanted to run geofilter at all home games in September, so we placed filters at games throughout the week. Run your filter during different times (two hours before the start time during one game and two hours after another game ends perhaps) to see if that increases uses and views. You can also expand the number of square feet covered to see if placing the geofilter in different areas, such as including the sidewalks, leads to higher usage. Another thing to keep in mind is who the opponent is. Because rivalry games are more likely to draw big crowds, engagement rates and views on your filter could be higher. We selected our team, targeted games, and were excited to get the ball rolling. Only problem? It would cost thousands of dollars to run the geofilter at Busch Stadium. Time for Plan B. We knew fans spend time downtown near the stadium during games, so we examined Cardinals Nation, a popular bar and fan hub just across the street from the stadium. Placing our filter here would cost fewer than $10 per hour depending on how many square feet we wanted to cover. You don’t necessarily need to place filters directly at the stadium; targeting nearby locations might even be more effective. If you luck out and discover that you can afford to run your brand’s geofilter at the stadium, keep in mind that large crowds tend to impact cell service. The last thing you want is to spend thousands of dollars only to find out that your audience is unable to use the filter. Forbes broke down which ballparks have the best and worst reception for each carrier, which can help guide your decision. Think of your filter as a fun experience, not a commercial. Consumers certainly don’t want to be sold to on Snapchat and will skip past your filter if it contains too much branding. The goal of your Snapchat filter is for your audience to use it and share it. To help make that happen, think of designs that make it easy to frame the user’s face. For one of our filters, we went with a “making it rain” theme and featured dollar bills falling—perfect for snapping a quick selfie. Stick to the sports theme and choose animated features that are video friendly. If you’re in town and available, stop by the location where the geofilter is located to take a quick selfie. Brands can’t view the content that users create, so having an example on hand might be beneficial for client presentations or reporting. 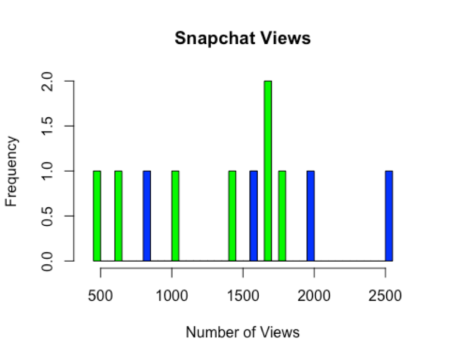 Once you’ve run your filter a few times, look at the numbers to see if any variables increase swipes, uses, or views. After running the filter at multiple Cardinals game, we developed a hypothesis that more people used and viewed our filter during blowout games; sports fans might be glued to the TV when a game is close and less likely to be scrolling through their phones. We crunched the numbers and found that our filter actually had more views when the game was close. It’s entirely possible that fans left watch parties at Cardinals Nation when games became predictable, so there may have been fewer people around to use the geofilter. Our geofilter also had more views at games against the Chicago Cubs – a long-time rival of the Cardinals. Again, crowd sizes matter, so it’s likely that these games drew more people to Cardinals Nation. Three of the top six games that received the most views happened when the Cardinals played rival Chicago Cubs, as seen in blue. Does your filter acquire more views during weekday or weekend games? Is there a difference in performance at afternoon vs. evening games? Is usage higher when you run the filter before the game starts? How does score impact usage? Are people more likely to use your geofilter during blowout or close games? Do team rivalries lead to higher usage? What location was the most successful? How much did it cost to cover that square footage? Analyzing this data will help you place geofilters that lead to higher usage and views. Most companies can’t afford to invest millions of dollars into a commercial. That’s where Snapchat comes in. Whether it’s during the big game or at another popular game, developing creative Snapchat campaigns can increase brand awareness by giving fans the chance to interact with your brand in a lighthearted way. Touchdown for the dancing hot dog.